Originally aired on television in 1974, this video is a nostalgic look at the history of the American railroad as told and sung by the legendary Johnny Cash. 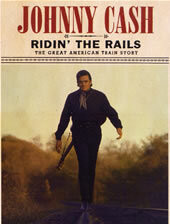 You'll ride the rails with Johnny as he looks back at the development of railroading in America, helps recreate famous incidents in railroad history, and hear him sing classic railroad songs - in his own unique style - such as Casey Jones, The Legend of John Henry's Hammer and City of New Orleans. Color DVD, 52 minutes.